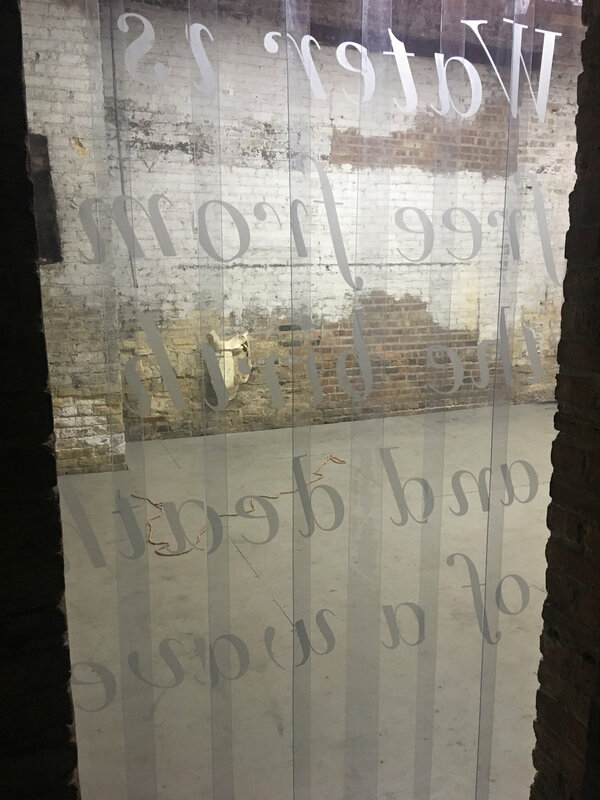 (Part 1) On September 15th 2017, a site-specific installation titled A Wave is Water opened at New Capital Projects, in Chicago IL. Its foundations began with the book No Death, No Fear by Thich Nhat Hanh. Occupying the raw space, I began to work in union with my surroundings. 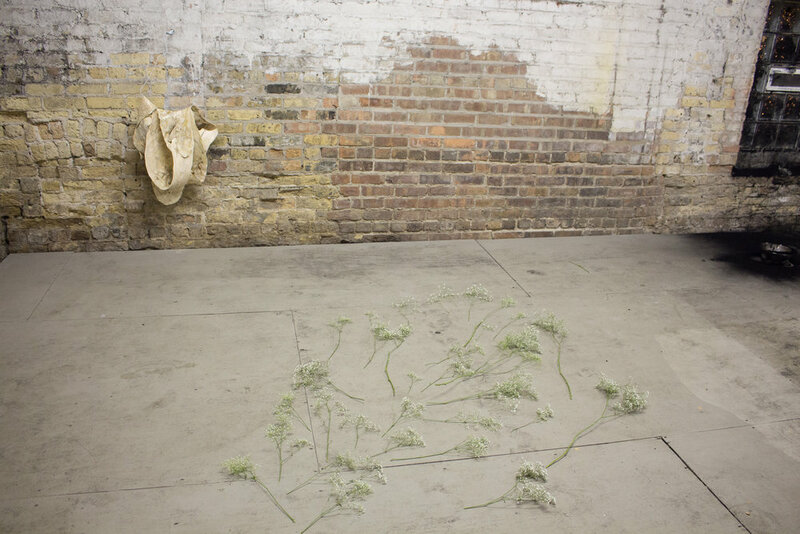 Collecting and arranging familiar objects and materials from daily life with those found in and around the gallery. 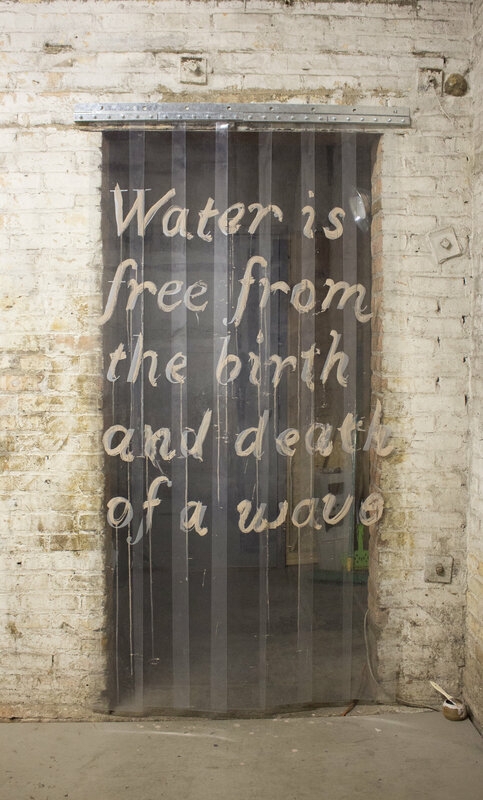 The text piece was written as an index: "Water is free from the birth and death of a wave". The back and forth motion became a call and response between me and the teacher, the reader, and the writer. 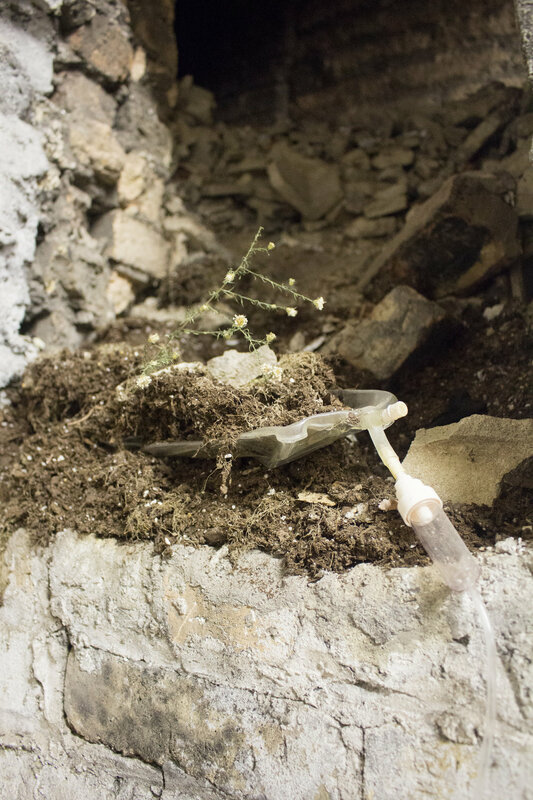 (Part 2) An IV bag was placed in a hollowed out space in the wall, connecting to what was beneath the floor: an accumulation of stormwater. Its drip made the only contact, offering up the slightest sound. A reading from No Death, No Fear sealed the space. A grasping ritual followed. 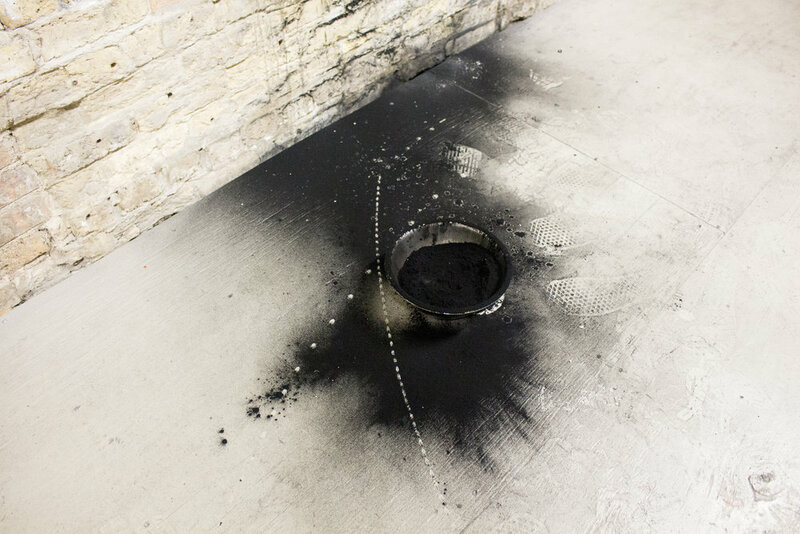 Participants were instructed to grab a handful of the charcoal mixture and smudge it against the window, while their gestures and voice released something they feared. 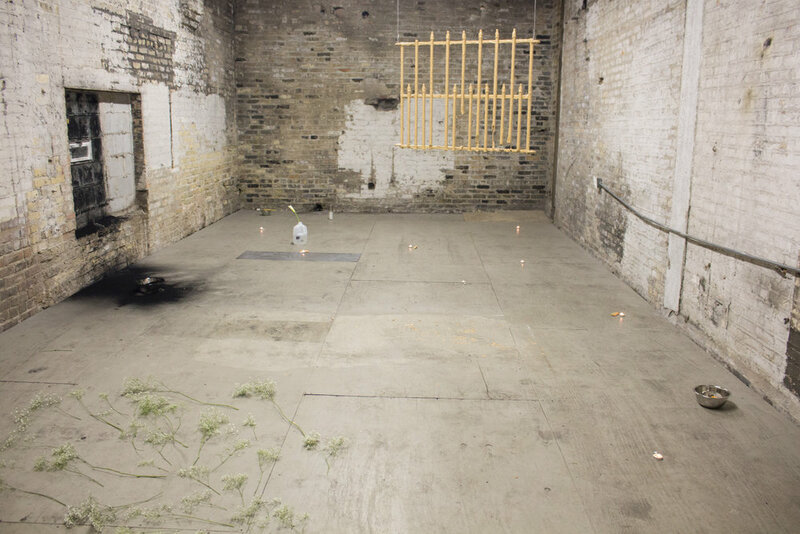 In the end, it was a small gathering of ten, a bell ceremony, tears, citrus ate, and a flower release ritual that closed the show and the gallery space. 1. "But still the light shines in muddied" - Sesame oil, Aztec healing clay and activated charcoal on glass window. 2. 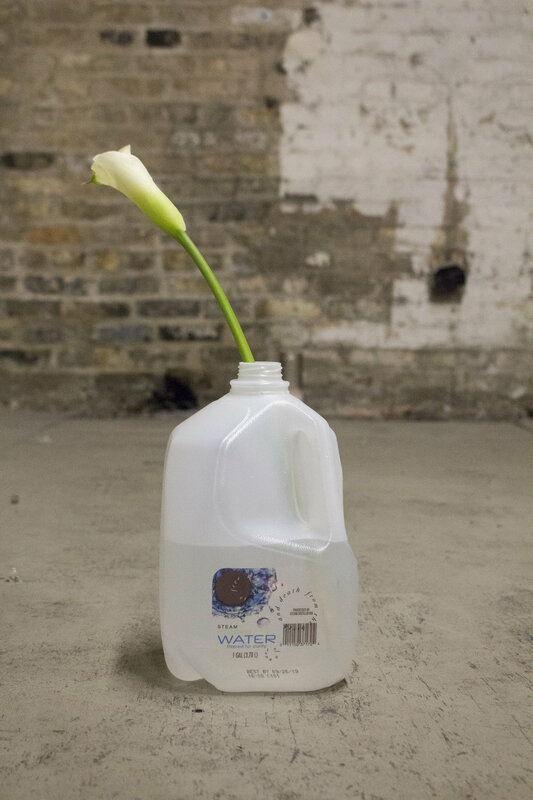 “Key” - Plastic sheet, water, chain, white calla lily, porcelain shell, polymer, activated charcoal, glass bowl, schisandra tea, black calla lily cut. 3. Found gate, gauze, plaster, red clay slip, latex, foundation and pigments. 4. 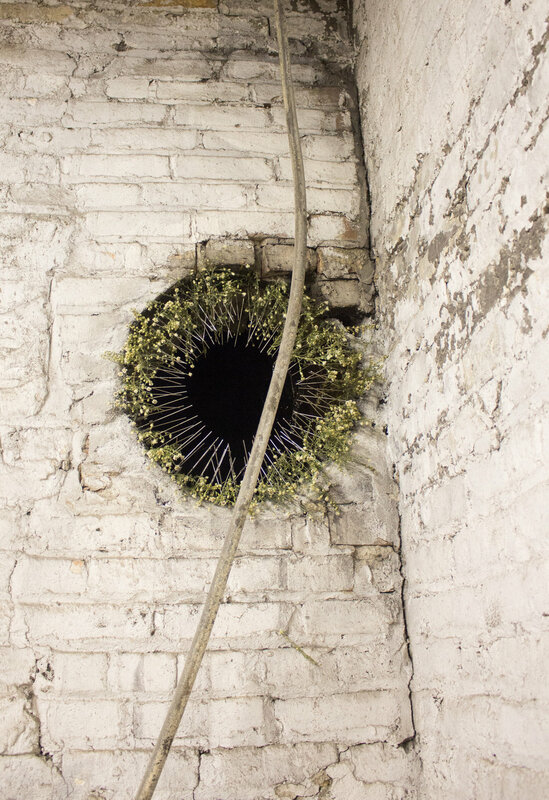 Flowers and weeds collected from outside the gallery placed in between steel spikes, a void in the wall. 5. "It's always so heavy and I'm tired" - Hardware, wire hanger, latex, foundation, pigments, still-water purified. 6. Hardware, black calla lily.